Display cases, cash wraps, & store counters in thermo-fused melamine in cherry wood or silver finish with tempered glass shelves reflect a contemporary vibe that is perfect for greeting customers at a medical spa. Full vision wall mounted cabinets with top lighting and/or a mirrored backer help products get noticed. Place countertop stands for iPad at point-of-sale register areas with a Square® card reader to enable paper-less checkout. 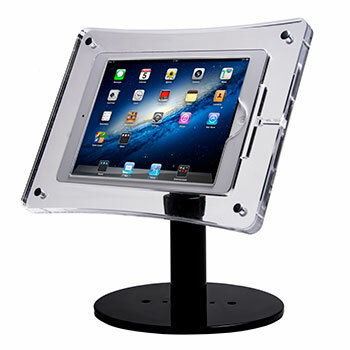 Floor standing touchscreen holders let clients browse treatments privately while they wait for appointments. Well ventilated iPad docking stations with charging slots power up tablets at night for technicians to use in the morning. 9" x 11-3/4" x 3-3/4"
Slatwall shelves are a versatile, efficient, and affordable way to display products and business literature. Great for fluffy robes and towels, fine skincare products and cosmetics, and promotional material, let this unique shelf design turn your one-stop beauty and health shop into a hit. Nesting risers, easels, and cubes put the spotlight on new and cutting-edge products by calling them out visually. Black, clear, and frosted acrylic make simple yet compelling modern displays. All the attention goes on promotional literature when placed on a clear plastic easel-style literature holder, so place stands everywhere. No anti-aging procedure demonstrates how drastically the dermatology industry has changed since the days of Clearasil and Noxzema, like the “vampire” facial. Known as the next best thing to a facelift, this anti-aging treatment calls for a tiny portion of a client’s blood to be extracted, added to a centrifuge device, shaken at high speed until components are separated out so that platelet-rich fibrin matrix (PRFM) can be injected into the client's facial tissue with a microneedle. The result? Scars and wrinkles are filled, new cells are turned over to promote healing, collagen and blood vessels are regenerated for skin smoothing and plumping, and a younger face emerges. Only a couple of treatments are required, and results last 15-18 months. The best thing is that there isn't a surgical tool in sight. What does this mean for medical spa displays? The vampire facial is a far cry from the narrow roster of conventional services people used to get when they visited a derm clinic. Not only have no-frills treatments become "frillier" but the product lines to support them have grown exponentially. Wherever there are tubes of beauty fluid to display, there will be risers, cubes, and shelves to draw attention to them. Pre-cancerous cells are still being zapped with liquid nitrogen; unsightly leg veins removed with needles and saline; liver spots lasered off of hands and faces with beams of light; and salicic acid body lotion prescribed for reducing the condition of Keratosis Pilaris (looks like chicken skin on the back of your arms). But other treatments under the arm of health and beauty are cropping up as the technology gets more sophisticated. Things started getting fancier with the arrival of the chemical peel; skin conditions like rosasea could be corrected with Beta and Alpha Hydroxy Acids, and Retin-A. Wrinkles are tag teamed with same, but add-ons like fillers and injectibles such as collagen and Botox™ (also known as botulinum toxin), Juvederm™ and Restylane™ are now the norm. Offshoot niche services create a plethora of additional money-making avenues for medical spa owners and they will also have to lay out more cash for spa displays to meet those needs. These days, beauty treaments are not limited to the face; many managers will offer weight loss and nutrition counseling, fat sculpting, or hair rejuvenation procedures. In recent years, science has revealed other ways to turn back time and promote health and beauty from the inside; some clinics offer lymphatic drainage services, hormone therapy, and B12 injections, and other anti-aging treatments that go deeper than the dermis. Displays for the expanded offerings of today's medical spa should be selected thoughtfully and with an eye toward design for the sophisticated consumer of beauty supplies and services. As dermatology broadened its scope to accommodate new procedures and ingredients, it seemed to morph into another industry entirely - today commonly known as a hybrid of the medical clinic and the beauty salon staffed with estheticians, and often one or more medical doctors on staff or in consulting roles. People are still going under the knife, but more people are running to the spa for non-invasive, impermanent treatments that make you look just as good, if not better than if you made the investment in plastic surgery. Modern derm facilities are the fastest growing portion of an $11+ billion industry and because of this, the need for displays such as cabinetry, slatwall shelves, risers, iPad stands, and other fixtures for upscale medically-oriented salons is great. That's of course where we come in, our expert staff and our massive warehouses full of hand-selected products that reflect the needs and values of what you do in your industry, and how you do it. Display Cases, Cash Wraps & Store Counters: Quality cabinetry, shelving, and register stands come in wall hanging and floor standing configurations for a host of uses in hybrid medical and beauty spas to provide a large menu of services for beauty-conscious clients. To highlight featured products, choose wall mounted shelves with a mirrored back and glass shelves to reflect the light. 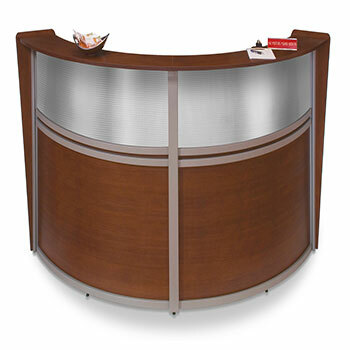 Purchase cash wraps and register centers in durable melamine with wood finish to set an upscale tone in your spa showroom. A flowing, spacious greeting area is essential for welcoming customers and making them comfortable. Never clutter up a reception area wall behind the desk with products that can’t be viewed or touched by customers - locate products on counters, where the customers are standing, but keep most concentrated in a boutique area they will have to walk through to reach their destination. Make sure bold graphics are placed behind the desk to reinforce brand, and create an inspiring setting for clients of beauty. Keep reception areas disconnected from the front door where possible so clients have to work their way through enticing boutique items to find it. Fill the seating area only with beauty items that turn a profit instead of cluttering up the space with useless and distracting entertainment magazines. iPad Stands for Presentations & POS Transactions: Instagram, Facebook, Pinterest, and other technology platforms oriented toward visual sharing - bring out our inner critic. In the age of “selfy-itis” across myriad social media channels we cannot get enough of ourselves - especially our faces. This brings self-critique to a new level for people under 30, and beauty salons and medical spas can meet the need to look great 24/7 with an expansive selection of beauty-enhancing services and products. In addition to using technology to share our lives (and faces), every beauty or spa owner needs an iPad in their marketing toolkit, and an effective holder. Floor mounted touchscreen kiosks placed in a reception area or in your boutique encourage customers to browse your product line by beauty concern, or learn about new services while they wait. Loaded presentations about your company excite clients about procedures they may be having, or don’t yet know about. Touch tablets are great for office use; every medical spa needs a full-blown social media campaign to provide statistical and scientific information as well as compelling advertising around unique, standout treatments. Convey that your products have been carefully researched and vetted by experts, that you have the safest, most effective procedures to offer, and back it up with facts and testimonials. Presentation stands mount on the wall, counter, or floor with locking or without, integrated cable management, and all designed for most iPads. Use touchscreen stands to conduct skyping sessions and provide virtual consultations with new clients too busy to come in. Use tablet enclosures as point-of-sale check out centers in the reception desk, for a paperless approach that scream "modern, leading edge!" For larger organizations like dermatology offices, charging stations with numerous slots will power up a plethora of devices overnight so they are ready in the morning. Display Risers & Easels: Highlight the newest skincare products by calling them out visually using cubes and nested pedestals. Offer customers free tote bags with your logo on it (it’s a great way to get your brand noticed around town), free gifts, and other “perks” just for visiting your salon. Turn visitors into future clients this way. 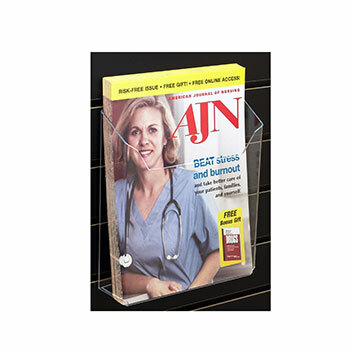 Clear acrylic easel-shaped stands are great for no-distraction advertising presentations. The selection here is vast, with black, white, frosted, and clear acrylic for a truly modern vibe that reflects a futuristic bent that guarantees they have come to a place that has the latest and greatest in anti-aging medicine. Smaller shelves, risers and cubes are great for essential oil and perfume bottles, eye, face, and body creams, serums, and other skin care. Eye popping displays should draw in customers and focus on the product - make sure the display materials are simple enough not to detract from the product you’re showcasing. Place promotional table within 10 feet of front door with special sale items or higher end items that are new on the market. Risers and cubes create a focal point; reserve the products people buy all the time for the side shelving and use these displays for calling out scientific advancements. Slatwall Shelving & Acrylic Literature Holders: Grooved shelves display promotional table tents and posters, catalogs, and brochures inexpensively, and can be used with existing store fixtures. Showcase products on shallow shelves 7-8” so customers see them without straining. Be sure to create a boutique within your medical spa so that the entire space fuels interest in product lines. Customers will be immersed in advertising literature while they wait, instead of reading magazines that don't funnel back into what you do. Products laid out properly in a venue will sell themselves when customers are encouraged to interact with them via testers at their leisure. Make sure all promotional materials steer clients toward learning about new services and products. Broaden your brand's personality by choosing - and committing to - a cause. Set up shelving displays with PR that tells them which causes you support and how they can help. Include price sheets for products rather than labeling each one separately. Be sure the lighting is soft and bright enough for customers to read about the products. Label each product with your company logo and contact information. Slatwall shelving provides a place for cross promoting related items, such as slippers, fluffy robes, spa music, and jewelry. Financial rewards are boundless for professionals who have chosen the anti-aging medicine and beauty industry as a career path. Upscale product lines and treatments are pricy, creating a great source of revenue on the side of services provided. Repeat business is assured because customers often have to return several times or more for a procedure to take hold. When results eventually wear off, clients will return for more rounds; as they age, they will add on more treatment types; and along the way they will be purchasing the supporting serums and creams in an effort to maintain their youthful appearance. As technology becomes more complex, non-invasive procedures grow in number and become even more effective at solving aesthetic issues for consumers. Like most doctors, people enter this field and related niche sub-fields with a desire to help people achieve optimal health and beauty. The process of helping somebody successfully beat a lifelong acne condition, or realize their weight loss goals after struggling for years with obesity, can be especially rewarding those who specialize in the field of beauty and wellbeing. The benefits of this exciting industry to the consumer are many-fold. Women and men are staying younger longer, thanks to advances in exercise, nutrition, and medicine. When their looks reflect their commitment to a healthy lifestyle, their careers have more longevity - and so they are apt to seek out non-invasive ways to keep their faces young, too. As long as people place a high value on youth, this industry continues to thrive, and product offerings continue to multiply. When choosing a menu of procedures and products, be sure your commitment to modern, cutting edge technology is conveyed with sophisticated displays for your boutique and office. Choose promotional literature holders, store shelving, cabinetry, and risers that visually reflect the breadth, caliber and modern tone of services you're providing. In addition to the products featured here, shop the website-at-large for tiered wicker and wire baskets and dump bins to distribute skincare and cosmetic samples; brochure stands and rotating magazine racks for promotional literature; trolley carts for medical supplies storage and transport; multimedia presentation stands for educating staff in new procedures or encouraging new client browsing; boutique signage; reception furniture; and anything else required to outfit a successful hybrid dermatology and beauty clinic. The next time somebody asks you for a "Nefertiti Neck Lift" or the "Madonna Eye Lift" - you'll be prepared!